The mood of the pioneer, the wanderlust of the pagan traveller exploring the universe of Roberto Cavalli, is the inspiration for Creative Director Peter Dundas’ fall/winter 2017 Roberto Cavalli collection. A melange of inspirations and influences, times and places, she wears her world, combining different cultures in a mix that feels quintessentially now and uniquely Cavalli. 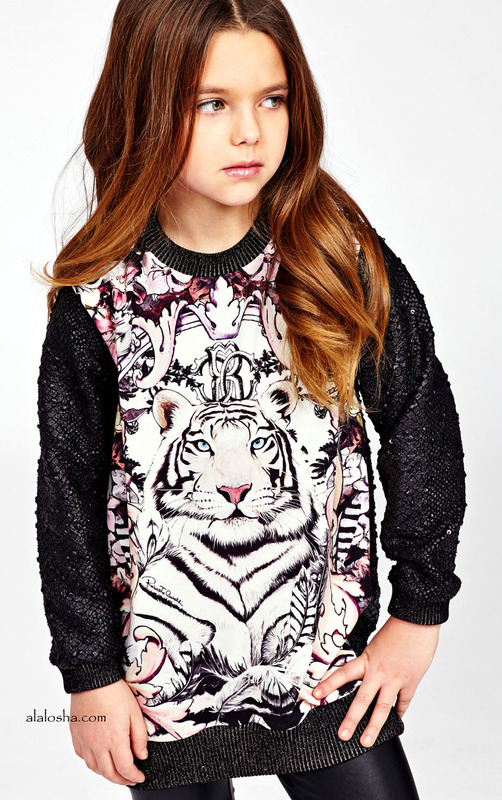 Girls black, long-sleeved maxi sweater by Roberto Cavalli, featuring a beautiful tiger crowned with the designer's logo and framed by a lovely pink and grey floral baroque design. 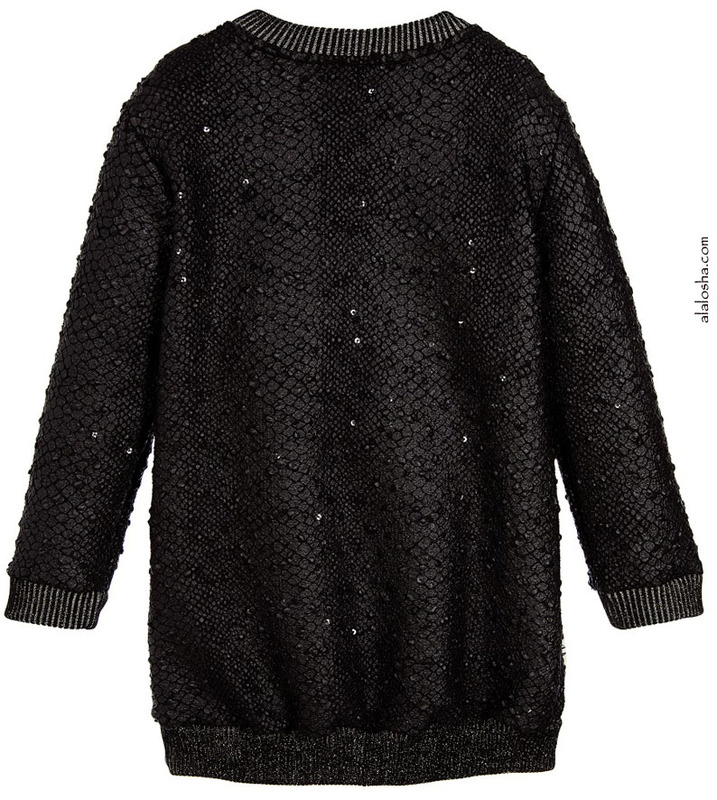 The sleeves and back of the sweater are made in a textured knit that resembles snakeskin, with baubles and sequins embedded in the weave. The cuffs, neckline and hem are trimmed in a gold threaded ribbing. 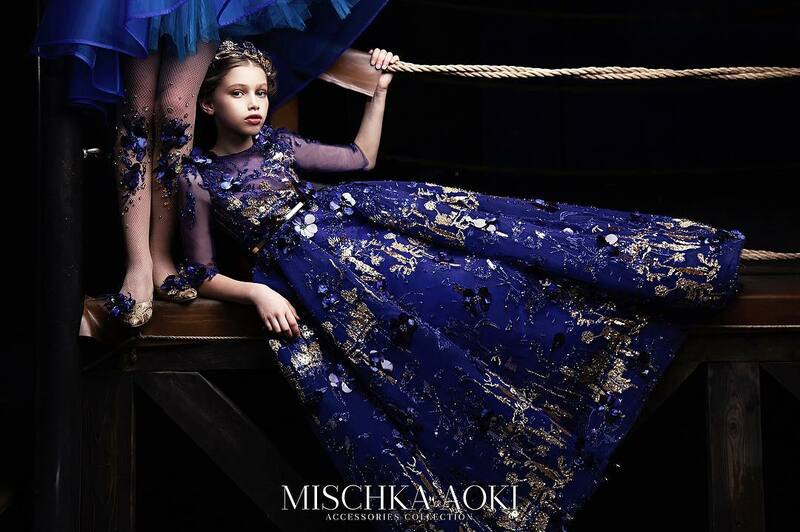 Girls black velvet dress from Roberto Cavalli. This elegant design is embellished with silver-coloured beading in a floral design, with sequin stars. The dropped waistband is trimmed in a silver metallic ribbon, with a trimmed hem. The sleeves are short and capped, with a concealed back zip fastening and an 'RC' logo badge stitched on the front, with a silky lining. 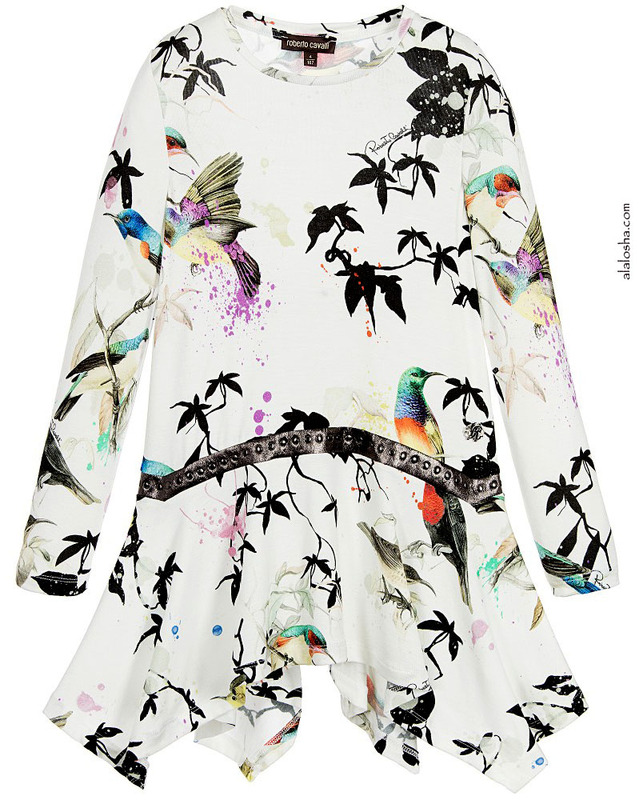 Girls ivory tropical bird print dress by Roberto Cavalli. 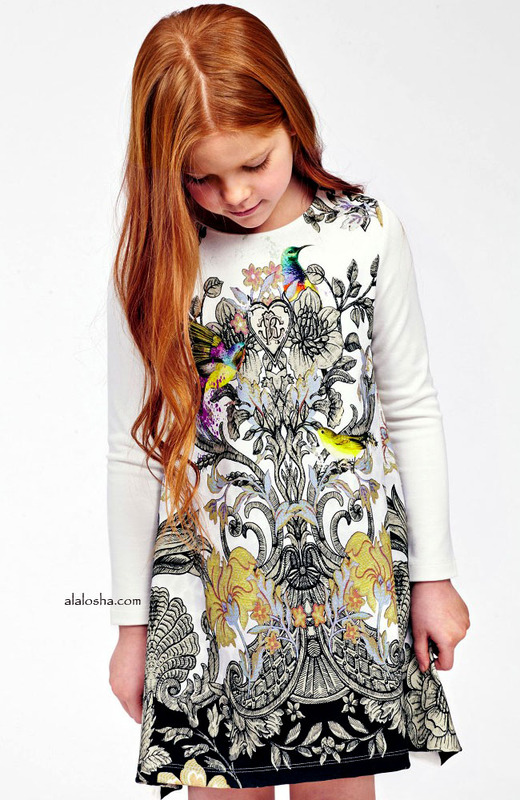 Made from lightweight, super soft, viscose jersey, patterned in a beautiful, colourful bird print, with the designer's silver metal logo motif sewn on one side. The dress has an asymmetrical dropped waist, edged in metallic silver fabric with silver studs, with longer length hems at the sides. 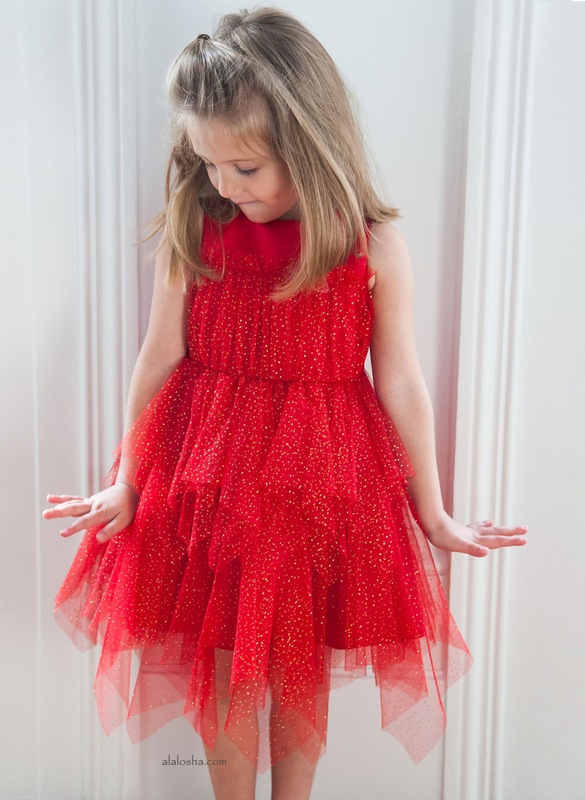 Easy to wear, this pretty dress just pulls on over the head and your little girl is ready to impress! 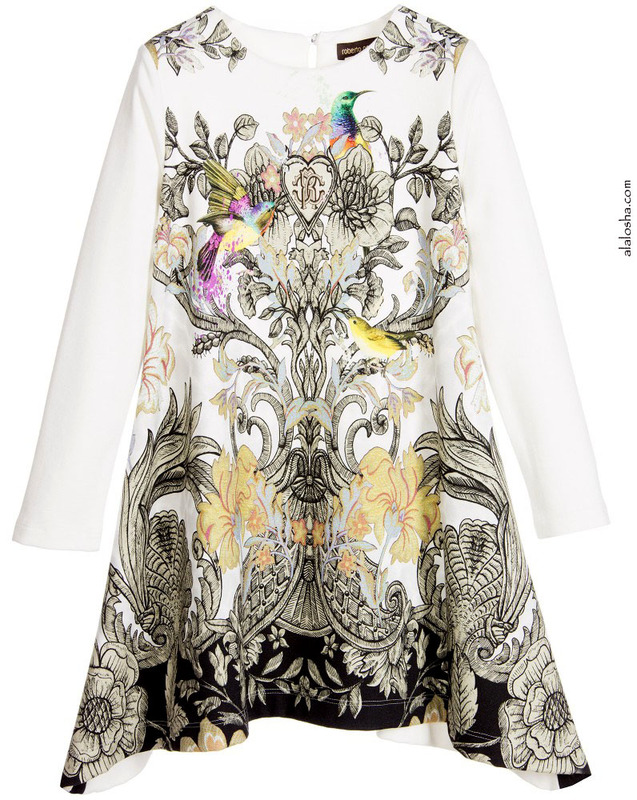 Girls ivory and black shift dress by Roberto Cavalli, made from a soft cotton jersey. 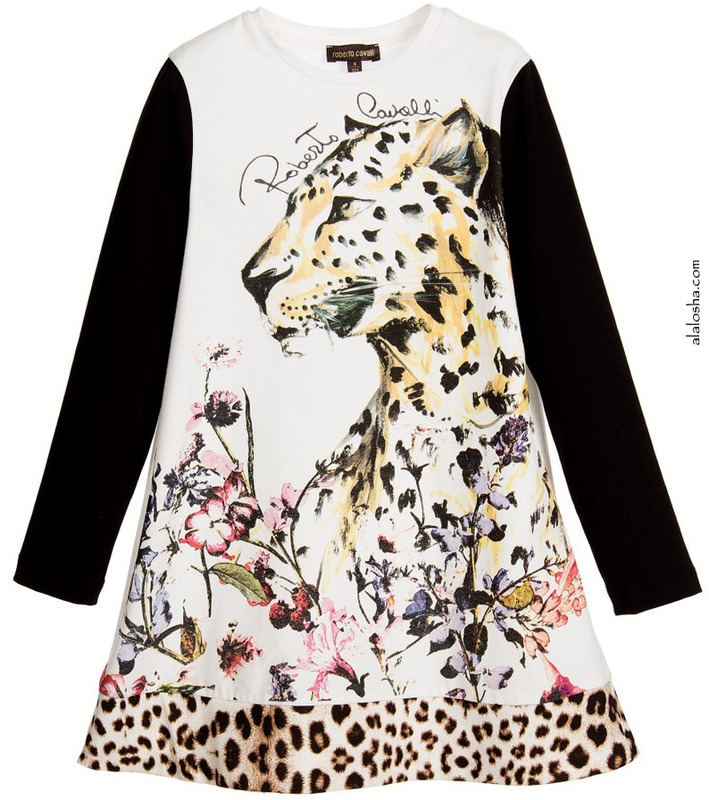 It features a print of a jaguar in a multi-coloured flower meadow with the designer's name, printed on the front. 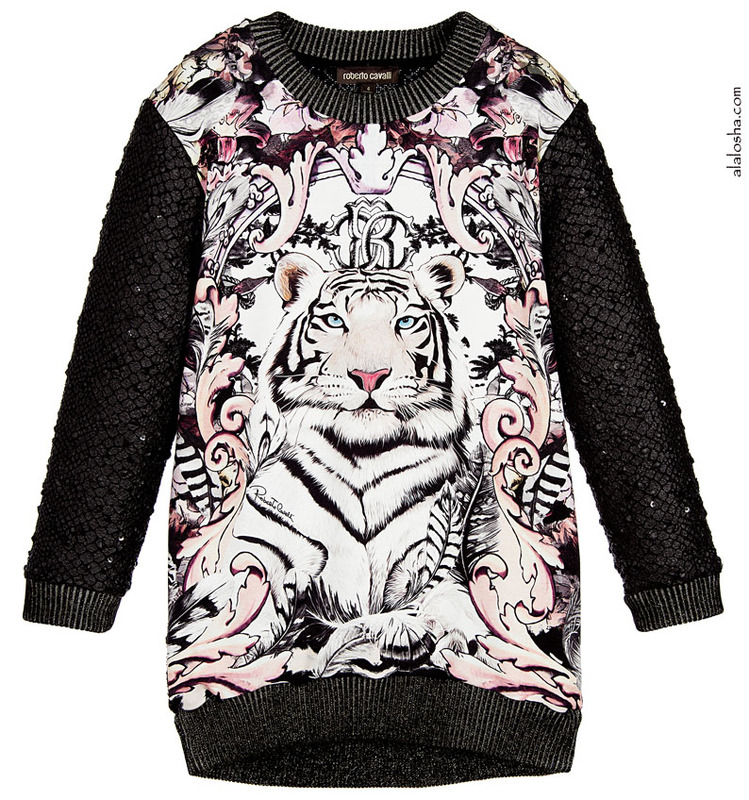 The long sleeves are black and the slightly flared hemline is in a striking jaguar print. It simply pulls on over the head, which makes for easy dressing. Girls gorgeous bucket style shoulder bag by Roberto Cavalli. Made from cotton fabric, it features the designer's pink 'wonderland' floral, fruit and butterfly print. It has one compartment with a cotton lining, large enough to carry small essential items, such as a mobile phone. 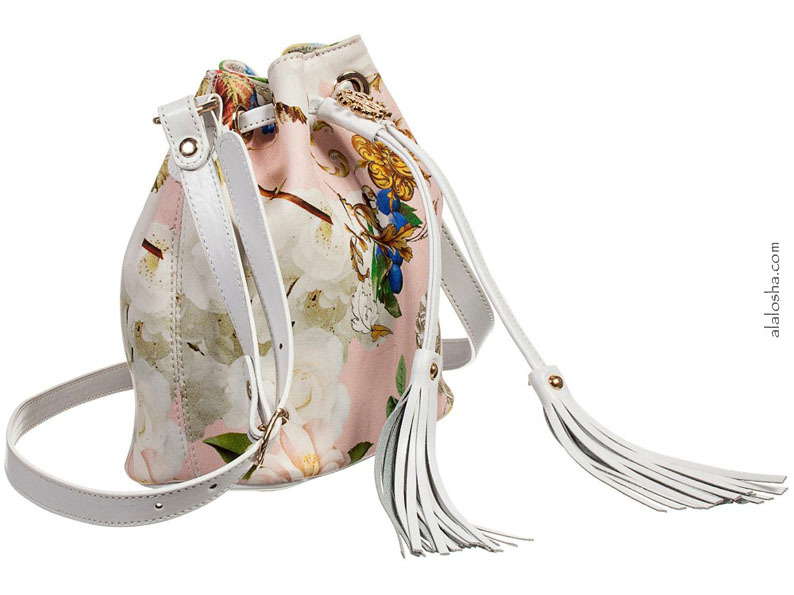 It has a synthetic adjustable shoulder strap and drawstring fastening with a gold metallic 'RC' logo and tassels. 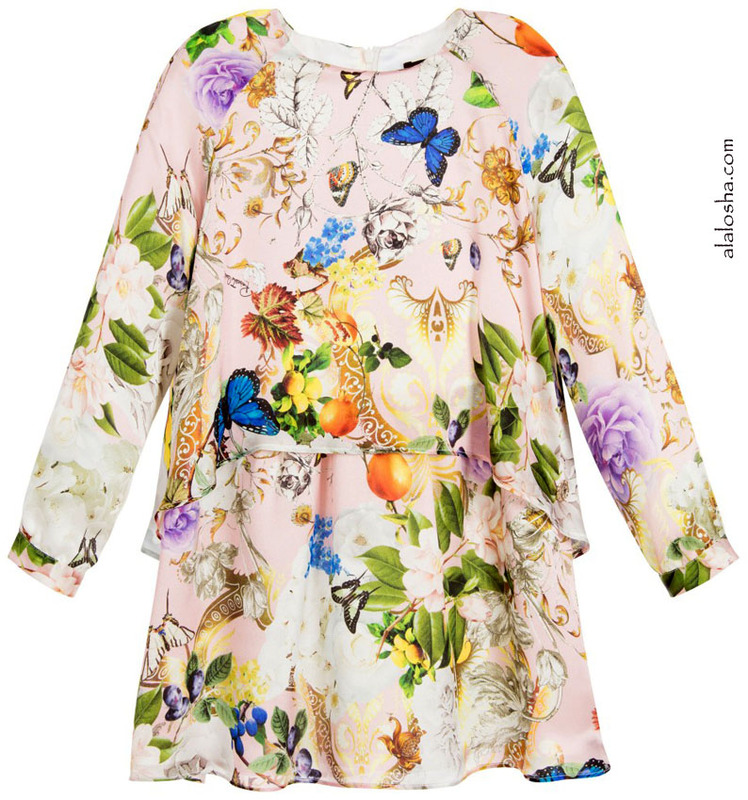 Lovely, pink silk dress by Roberto Cavalli, with the designer's fabulous 'wonderland' floral, fruit and butterfly print. With the appearance of a blouse and flared skirt, the top falls longer at the back than the front, drapes beautifully and has the designer's silver metal logo sewn on one side. There is a concealed zip fastener at the back and little silver buttons fasten the cuffs. Fully lined in ivory, it would look perfect for any smart or special occasion, worn with gold pumps.